If you’ve ever wondered if Heroes of the Storm‘s Stitches could be cute… well, kinda. 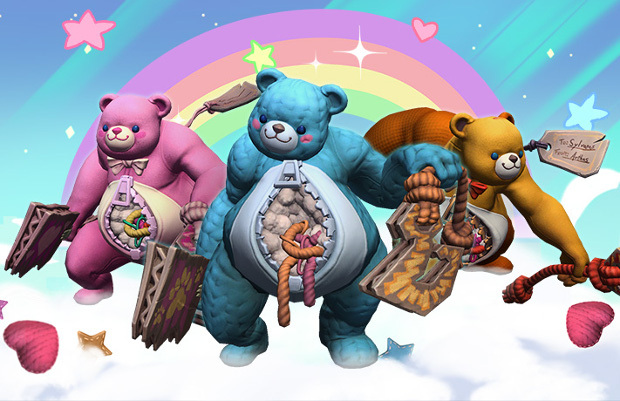 Today, as part of the Heroes holiday content, Blizzard unveiled Cuddle Bear Stitches, a kinda cute/kinda creepy Stitches plushie skin. The update also includes action figure skins for Dehakasaurus Rex and Valeera, as well as two toy mounts, an Epic Lion mount, and a Legendary plushy Unicorn. Of course, the event isn’t all toys. There are a few additional skins and mounts, as well as a Board Game solo quest. To participate in the event, players will need to complete Quests and earn the opportunity to roll some die. Move around the board and unlock even more quests. Knock down dominoes and unlock quests. (Yeah. You’re unlocking a bunch of quests.) Those who make it around the entire board will earn a new announcer pack. The announcer pack isn’t the only reward. There are also portraits, sprays, banners, emojis and more. A full rundown on the event, items, and more are available on the Heroes of the Storm page.